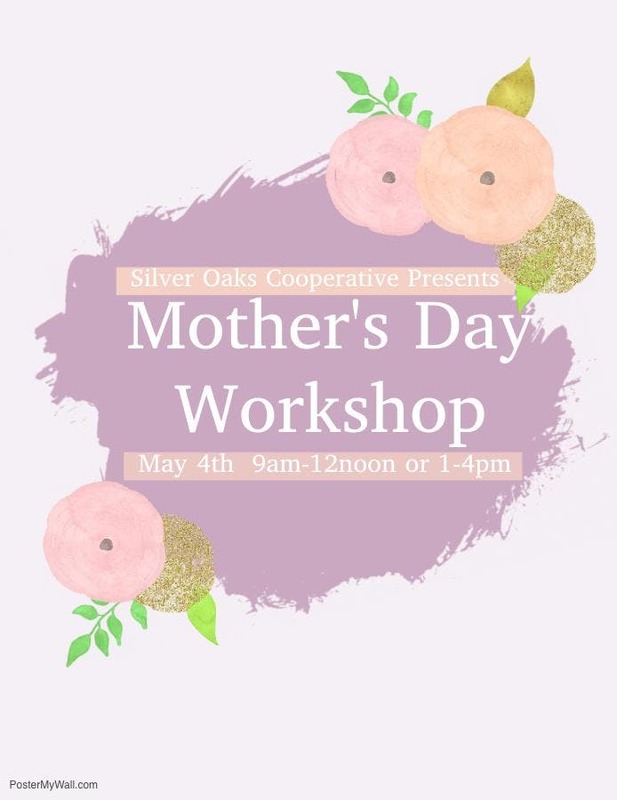 Silver Oaks Cooperative School Presents a Mother's Day Workshop! Give Mom the gift of time for Mother's Day! For three blissful hours she can know her kids are having a blast and she doesn't even have to see the mess! Drop your kids off with us and we'll take it from there. They can play both inside and out, and create two lovely gifts just right for a special someone in their life. Our Winter Workshops sold out so don't delay! The children will be assisted and supervised by a combination of an experienced Silver Oaks teacher, parent volunteers from our school (all fingerprinted and background checked), and student volunteers. We will all be in the same room together. Please pack a nut-free snack for your child and water bottle. We will most likely spend some time on our playground so please dress accordingly.